In June of 2014, we were preparing to release an official edition of our new software, DVR Examiner 1.0. 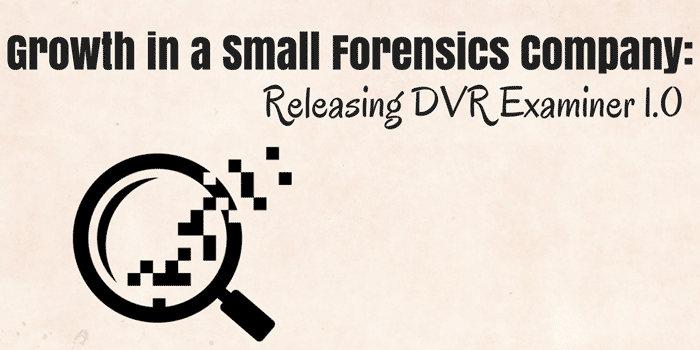 This release contained many new features and filesystems that weren’t present in any prior versions of DVR Examiner. We had spent countless hours developing and testing the release and were confident in our work. However, releasing a brand new software product is almost always a very humbling experience. Despite our confidence, this was a new process for our team. There were plenty of things we didn’t account for in the release of DVR Examiner 1.0, and some things we just plain missed. On the bright side, we designed DVR Examiner with the intention of releasing updates to this product often, so we were able to address many initial issues rapidly. I can’t even imagine what it was like to produce software prior to widespread internet availability. In those days, if you didn’t get it right, you had to ship out updates via mail – a much slower (and costlier) experience. That isn’t to say that developers today shouldn’t try to do our best to release stable software the first time – we certainly do – but we are human, and mistakes will be made. Thankfully technology has made it possible for us to correct those quickly! Later, when we released DVR Examiner 2.0 we encountered a similar process. While we did countless hours of development and testing to bring new features and capabilities to the product, some issues arose after release. In situations like this, I like to remind myself what it was like when we first released DVR Examiner 1.0. We continue to address kinks and bugs in every update, alongside new and innovative features. We maintain the belief that no good thing comes without it’s challenges. However, we have assembled a great team, and learned from these moments of growth within DME Forensics. Now, we are even more responsive than we were in the early days. Our newly introduced DVR Examiner Updater streamlines this process even further, allowing users to get DVR Examiner filesystem updates as they are available. In the next post in this series, I’ll take a look at what it was like to start building our team beyond our first employee. Thanks for reading and stay tuned!